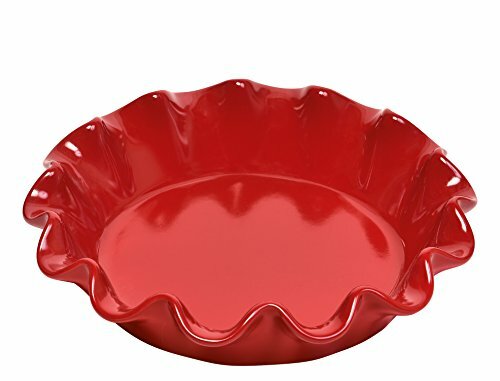 Our Ruffled pie dish is ideal for all your fruity desserts : with cherries, apples or pears ... and you can use it for making all sorts of cakes. As with all Emile Henry products, it can be used in the oven, microwave, freezer and dishwasher without losing its color. Use it also for your savory recipes, with mixed salads, pies and gratins ... its original design and bright colors will bring a touch of color and fun to the table. All Emile Henry products are made in France and offer a ten years guarantee. SUPERIOR HEAT RETENTION. Burgundy Clay has superior even-heat diffusion and heat retention properties; it keeps food hot on the table longer. RESISTANT AGAINST TEMPERATURE CHANGE. For use in the oven up to 520 Degrees F. Oven, broiler, and microwave safe: Can go directly from freezer or refrigerator, to a hot oven, to table. DURABLE AND SCRATCH RESISANT. Extremely hard glaze does not scratch and does not craze. Durable for everyday use. The highly resistant glaze is ideal in the kitchen for making delicious meals and desserts. EASY TO CLEAN. Dishwasher Safe or hand wash with soap and water. 10 YEAR GUARANTEE. 10 YEAR warranty against manufacturing defects when used in a household environment.